Ever since Typhoon Yolanda struck the Philippines, different sectors of society started to help out those who survived the tragedy. Individuals, the government, NGOs and corporations alike have helped in their own ways possible. Top Draw Animation (TDA) Inc., an animation company that provides a full range of pre-production and production services to leading international producers, was one of the many to act on the tragedy that happened. The said company has partnered with Gawad Kalinga to support the reconstruction program for Yolanda survivors. By agreeing to cancel their Christmas party last December, its employees were able to save three hundred thousand pesos while the Top Draw Management also decided to give one million pesos to help out the survivors. 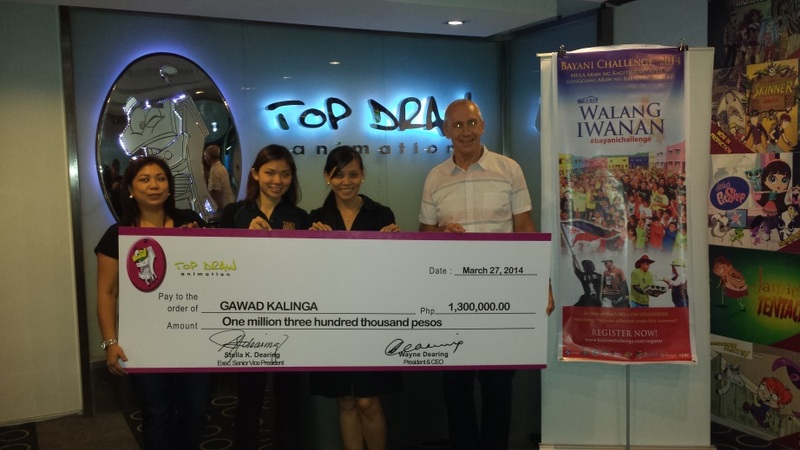 Last March 27, 2014, Top Draw Animation Inc. represented by its owner/President and CEO, Wayne Dearing and its Executive Senior Vice President, Stella K. Dearing handed over the check worth PHP 1.3 Million to Gawad Kalinga. To welcome Gawad Kalinga, represented by GK’s Corporate Shared Services Head Issa Cuevas-Santos and Partnerships Manager Joyce Uy, the company decided to hold a mini event in their cafeteria attended by employees from different departments and directors of the company. Even drinks and a little “merienda” were served. This is the first time Top Draw Animation Inc. has partnered with GK but Jay Carrion, General Manager of TDA and Stella Dearing have already communicated their interest to partner again in other programs of GK in the near future. They want this partnership to be long-lasting and they want to bring impact not only to the survivors of Typhoon Yolanda but also to others as well. Truly, Top Draw Animation Inc. has embraced the GK Way. 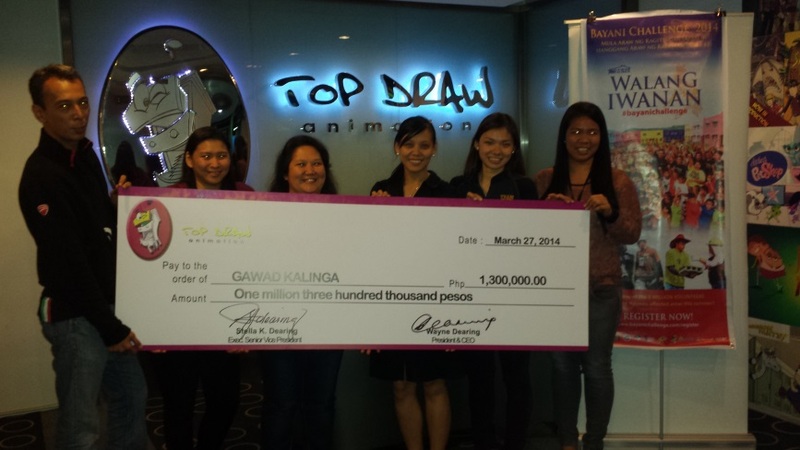 Thank you Top Draw Animation Inc. for being part of the movement that drives the Spirit of Bayanihan in the country. Like Top Draw Animation Inc., you too can be part of Operation Walang Iwanan and help GK in relief, rehabilitation and reconstruction. This coming summer, join 1 MILLION VOLUNTEERS in rebuilding Aklan, Antique, Bohol, Capiz, Cebu, Eastern Samar, Iloilo, Leyte, Negros Occidental, Palawan, Samar, and Zamboanga. Read more details about the Bayani Challenge 2014 HERE.